We are open rain or shine except major holidays. The first Mar Vista Market took place August 6, 2006. The goal was to bring fresh produce directly from California farmers to the community. Now, over a decade later, the Mar Vista Market is one of the most popular farmers’ markets in the Los Angeles area, attracting thousands of buyers and visitors each week. Farmers and other purveyors come from many counties in California to offer fresh fruits, vegetables, cheeses and other dairy products, meats, seafood, pastas, juices, and a variety of delicious prepared foods to enjoy at the market or to bring home, and more. The Sunday markets are bustling, as Mar Vistans come out to shop, eat and visit with their neighbors. Kids are welcome and enjoy special activities, just for them. Although dogs are not allowed in the market per California health regulations, we offer complimentary dog-sitting services. With regular DJs, there’s always music in the air. Besides the obvious benefits to buyers and sellers, the farmers’ market also achieves broader social impacts – including community development, improved health and nutrition, and preservation of family farms. Thanks to all in the community for your ongoing support! You make this thriving entity what it is today. 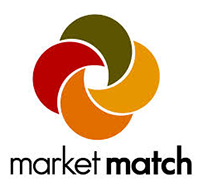 Market Match is California’s healthy food incentive program, which matches customers’ federal nutrition assistance benefits, like CalFresh, at farmers’ markets. The program empowers low-income customers to make healthy food choices and benefits hundreds of small and mid-size California farmers. Electronic Benefit Transfer (EBT) recipients can visit our info booth on Pacific Avenue to access their food benefits electronically by swiping their card in exchange for market tokens.